Moving the FPS way in VR with a gamepad causes nausea to pretty much 45% of the players (nDreams CEO dixit) so companies are coming up with a lot of creative solutions to workaround this problem. 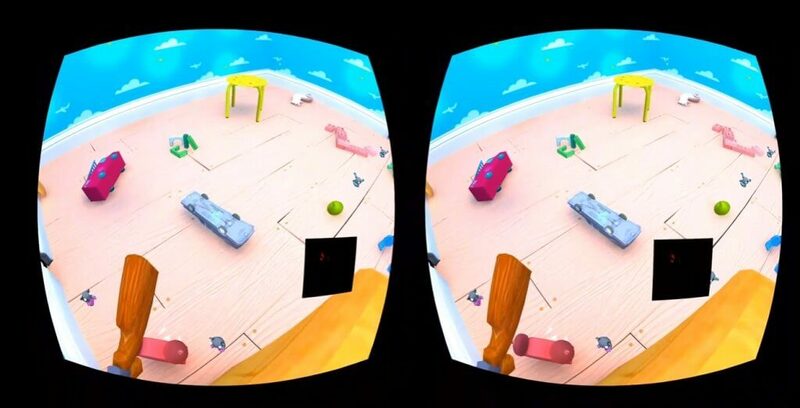 One of the main solutions is called blink transition, and it has been popularised by great experiences such as Epic’s Bullet Train and GearVR game Land’s end. With this solution you basically look at the point where you want to move and just press a button that will teleport you there. This transition sometimes happen by closing and opening virtual eyes in front of the user or simply lerping him there really fast. While it’s true that this technique usually does not cause any nausea it is a big presence breaker for me: looking at a point and pressing a button to suddenly be there is not a very natural way of moving… how could I improve it? What if I could detect if the user is truly blinking? Instead of closing some fake eyes in front of the player and having to press any button it will feel like a super power, think about NightCrawler from the X-men. This will suddenly make the movement system way more natural and amazing, improving the presence factor a lot while being more enjoyable and comfortable. Some experimental HMDs are starting to support eye tracking, the most notorious one being the FOVE HMD: if you can track the user’s eye it has to be trivial to detect if it’s closed. 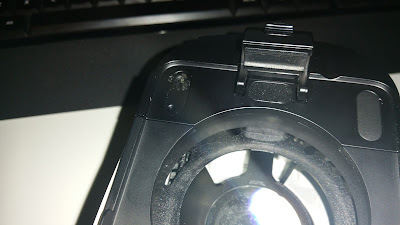 But all I had in my hands was a GearVR for Galaxy Note 4, some hacking was needed. I realised that the GearVR has some covers in the front to prevent scratching the phone when attached. If you remove any of this plastic-covers.. voilá! there is a screw! Then a new idea came to my mind: I don’t need to track the eye, I just want to know if it is opened. When you look at someone’s eyes they happen to reflect a lot of light, but when you close them your skin is not near as reflective. right in front of it) was still too far away and angled to read this subtle amount of light. 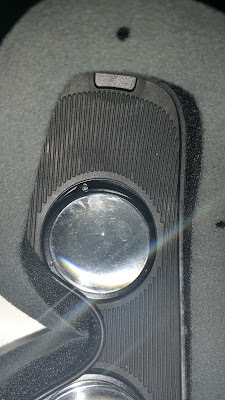 A visit to the store will solve this: 10 cm (2£) of optical-fibre: If I put one end in the screw’s hole facing directly the camera and the other end facing the eye I can redirect the light from the screen to the eye to the cable to the camera! All that rested was to create an ultra-simple script that will read the amount of light received: just add the value of all pixels and check if it’s higher than a threshold. Thanks to Unity and Android I can control the resolution and discovered than using a 20×20 texture was good enough so the calculation was lightning fast… even detecting the fastest blink. For obvious reasons I set that the eye had to be closed for around 500ms or the user will be travelling surely more than desired. My last problem was with Android 4.4.4 and the camera sensitivity. It seems that they added some enhancements in Android 5, but with my version I could not control the shutter, so sometimes it was not sensitive enough to read the light. The solution i quite lame, just sightly remove the phone from the HMD (while keeping the USB connected) so a lot of light comes inside the camera this will adjust the shutter from you and everything will be fine! This was so simple/cheap to do (and so useful!!) that I would love future HMDs to come at least with some sort of blinking detection. VR movement sure is an interesting problem and when deciding between presence or not-sickening every little can help.